A reader won’t get far into a Virginia football preview for 2018 without seeing what seems like a prerequisite line. The Cavaliers must replace leading tacklers Micah Kiser and Quin Blanding as well as NFL Draft lineman Andrew Brown this season. That’s understandable, of course. Kiser and Blanding led the ACC in tackles per game for three straight seasons. They’re both in NFL camps right now along with Brown, who salvaged his career when Bronco Mendenhall arrived. Kiser won the Campbell Trophy, known as the Academic Heisman, last year too. That’s a lot of starpower and firepower to replace. Yet, it sort of glosses over the fact that UVA will field a fairly experienced defensive group this fall. The roster includes 11 players who have started at least three games on defense. Five of those guys – Eli Hanback, Chris Peace, Jordan Mack, Bryce Hall, and Juan Thornhill – have started nearly every game of Mendenhall’s tenure at Virginia. And defense, of course, is Mendenhall’s forte and something he likes to piece together each season. That makes this year’s defense an intriguing one. If the D can answer some questions about defensive line depth, stopping the run, and blending in new faces with the experienced core, then it could be a strong point for the team. Mendenhall said entering year three with so many players on the team familiar with how things work in the program is beneficial. With that said, the defense still needs to figure out who some of the starters will be when the season opens against Richmond on Sept. 1. The “99 Virginia Football Thoughts Before Kickoff” series continues with a look at one of the candidates. While the defense boasts 11 players with at least three starts, one player outside that group is a leading candidate to open the season as a starter. That’s sophomore Charles Snowden, who has worked with the first string defense at outside linebacker throughout the spring and early in the preseason. Of course, if you follow Snowden’s development curve, that rise isn’t too surprising. Here’s a guy that had yet to play varsity football less than three years ago in 2015. But after watching the season opener at his new school St. Alban’s – he transferred over from Blake High School – he approached coach Gary Schnell about joining the team. Schnell played Snowden at defensive end and receiver. Still, even through the summer of 2016, Snowden had his eye on a college basketball career. At 6’7”, that makes some sense but he hadn’t drawn much interest entering his senior year in 2016. He decided to explore college football opportunities when Virginia hosted him on a visit in October that year. After that visit, he immediately accepted a scholarship offer from the Hoos. Snowden went on to record 35 tackles with 5.5 sacks, 2 forced fumbles, and 2 fumble recoveries as a senior in 2016 at St. Alban’s. That earned him some all-conference and all-area recognition. He received a three-star rating from the scouting services. That doesn’t sound like the resume of a player that could carve out a role as true freshman in the ACC. Yet, that’s what Snowden did. He played in 10 of 13 games last season and came through with several eye-catching plays in mostly a pass-rush specialist type of role. Those plays included a key third down sack against Duke to help preserve that 28-21 win, an assisted tackle for loss in the 20-14 win at UNC, and three tackles with a forced fumble at Louisville. He blocked a punt at Miami too. Then, this spring Snowden assumed the first-line spot at outside linebacker. He’s remained as the projected starter in the SAM (strong-side) linebacker spot at the beginning of preseason practice. 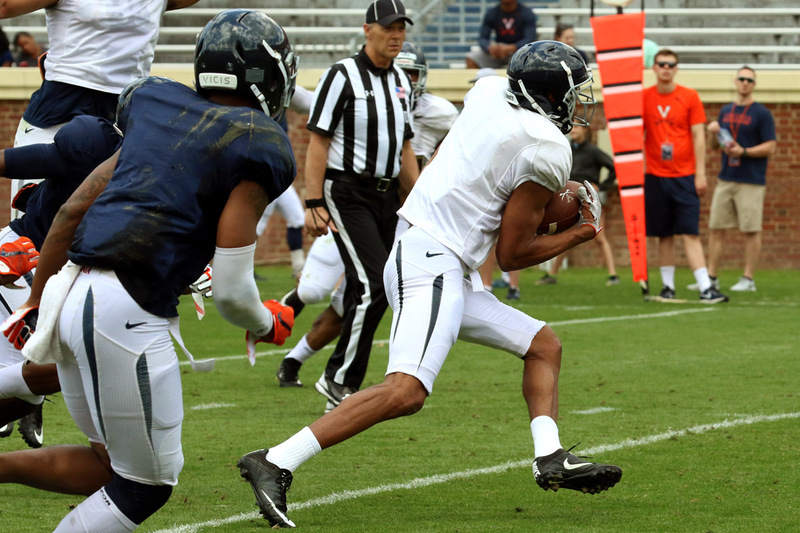 Snowden also put in off-field work at UVA over the past several months. He came in at 205 pounds, but he’s up to 225 now with hopes of reaching 230 this season. That’s a byproduct of weightroom work and routine changes to take better care of himself as an athlete. In fact, Snowden said he has undergone significant habit changes over the past year with the Cavaliers. Some of that came through the leadership example of a player like Andre Levrone, who grew more committed in that area late in his career at Virginia, that became good friends with Snowden. Snowden noticed players like him and linebacker Chris Peace and how they went about their business and preparation. Snowden knows there’s still work to be done to extend his rapid development with football. Last year, while he made some plays, he really was just relying on his speed to run past blocks. That won’t work for an every-down player vs. a pass-rush specialist. So while he’s still focused on getting pressure to the QB when called upon, he’s trying to get better at the other pieces needed to be the SAM linebacker. That includes gap integrity and owning his gap assignment, particularly as the defense focuses on stopping the run better this offseason. Snowden wants to be more physical at the point of attack and with shedding blocks too. That means better hand placement and more violent action to break free from blocks. He’s gaining confidence with each step of his development. Kris- another incredible article and you are correct, defense is Bronco’s forte and year three we should see points per game come down again from 33 in 16 to 28 in 17 to 23 this year.